I’ve been a fan of Eric Church’s music ever since his first album, “Sinners Like Me,” was released in 2006. By the time the third single, “Smoke a Little Smoke,” from his second album came out and I heard the opening guitar riffs to that country rocker, I knew I would be a fan for life. He’s always pushed the boudaries of what most people define as country music and continues to do that today with his latest single, “Give Me Back My Hometown.” While a lot of people debate and try to categorize Eric’s music as this genre or that genre, the only question I’m concerned with is “Do you like the song?” Who cares what genre it is – if you like it, listen to it. Brian Mansfield from USA Today proclaims it as a song that will be among the best of 2014. He goes on to say that “Lots of country singers these days play off high-school memories. Few admit to feeling bruised and beaten by them because of an ex’s presence. 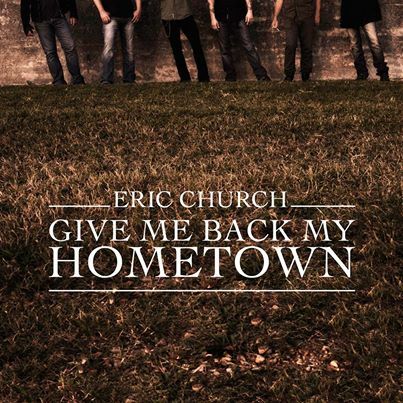 In Give Me Back My Hometown, each drumbeat connects like a baseball bat taking another shot to the rib cage.” For me it’s the dual crescendos, foot stomps and hand claps combined with a story I can relate to having grown up in a small town in the Midwest that clinch it for me. And yes, I can recall many weekend nights at the local Pizza Hut bemoaning my sorrows about a girl over pepperoni pizzas and bottomless Cokes. I hope Mr. Mansfield’s proclamation comes true and this song gets the credit it deserves. It’s already one of my favorites and I hope you enjoy it as much as I do. For a more detailed reivew of the song, you can read these excellent reviews here and here. The single is too new so this video is all we have for now. As the song’s popularity continues to grow, it will only be a matter of time before a full-fledged video is released and I’ll be sure and share it here. Full lyrics to the song aren’t available online yet but the first two verses are listed in the video description on Youtube.